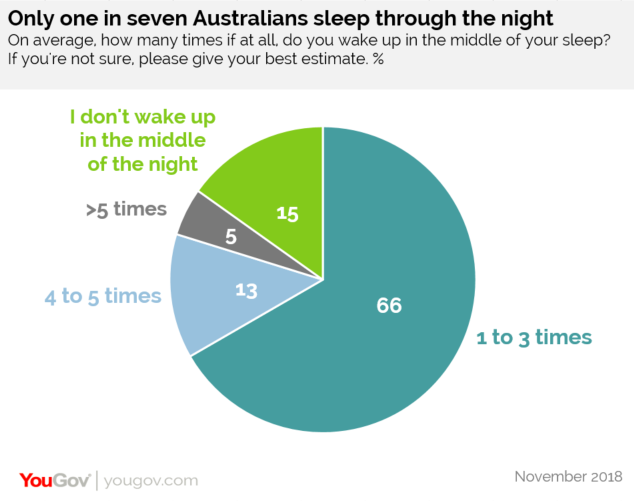 on March 21, 2019, 2:12 p.m.
Sleep plays a big role in our everyday lives, but one in three Australians are not getting enough shut-eye, new YouGov research finds. According to Healthline the average adult should get between seven and eight hours sleep a night. But while the data shows that while two in three (68%) achieve this, one in three (32%) Australians do not. 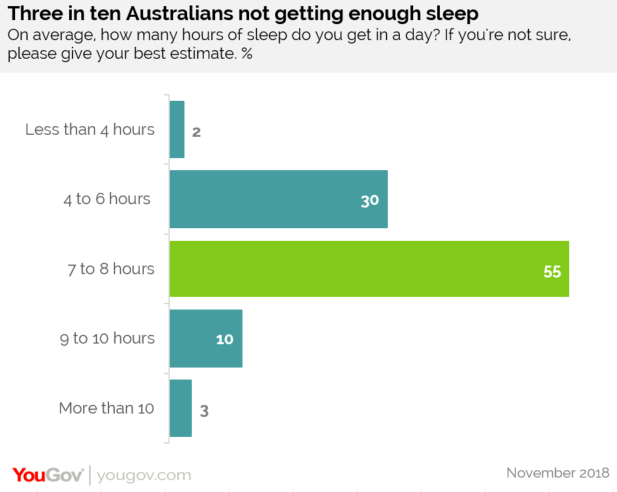 YouGov’s data shows that approaching six in ten (58%) Australians take less than 30 minutes to fall asleep, and a third (32%) take less than an hour. The remaining one in ten (10%) take more than an hour to drift off. Women appear to have more trouble falling asleep than men, with 13% taking more than an hour to fall asleep, compared to 7% of men. The research also reveals that over eight in ten (85%) of Australians wake up at least once a night, while the remaining 15% sleep through. Those who sleep through the night are more likely than the population as a whole to describe their quality of sleep as good (37% compared to 28%). Men also appear to be sleeping better than women, with four in ten (41%) describing their sleep as good compared to three in ten (33%) of women. YouGov’s study also finds that one in five (20%) of Australians sleep with a ‘comfort object’ (some sort of stuffed toy or security blanket). Younger Australians (those aged 18 to 24) are likely than older Australians (aged 45 and above) to do so (41% vs. 8%). Those who sleep with a ‘comfort object’ also appear to sleep better than those who don’t (51% vs. 34% who describe their quality of sleep as good).